After a quiet one last week, it's back to normal on the gig-announcements front. If you fancy any of these, don't stay up too late watching the ever-so-exciting election results; tickets should be available from around 9am on Friday morning. The five members of Kansas City band The Get Up Kids have gone to quite some lengths to disassociate themselves from the emo scene, even saying sorry at a reunion gig. Whether or not they invented the much-maligned genre, they play Koko on 5 October. Get tickets here. Eyeliner most definitely optional. Grammy-winning alternative rockers Wilco have earned the moniker of 'cult favourites' by delivering a string of first-class albums of magnificent musicianship without ever achieving wide recognition. Get tickets to see them at the Roundhouse on 28 and 29 October. Here's a name that should speak for itself: Roger Daltrey. 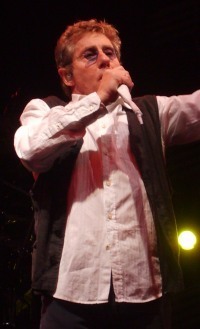 The lead singer of The Who will play the band's album, Tommy, in full - plus other classics - on 21 July at the IndigO2 inside the former Millennium Dome. Get tickets here (be warned: they don't look too cheap). Canadian folksters Timber Timbre portray an intriguingly bleak and beautiful picture of the country's wilderness through their music. Released last month, the group's latest album is full of subtle humour against an uneasy backdrop. See how it translates to the beautiful Union Chapel on 1 November. Tickets from here. Chart-topping Hawaiian-born teen heart-throb Bruno Mars makes music that sits somewhere around the relaxed soft-rock category. He's certainly not going to be everyone's cup of tea, but he will play the Hammersmith Apollo on 17 and 18 August. Tickets available here. Also booking this week: unexpected half-time Superbowl star Kina Grannis, Peter Frampton, Owl City, and Cat's Eyes, featuring Faris Badwan from The Horrors.